Diagnose 9-5 A/C problems by calibrating your ACC unit. Start the engine and press the auto and off buttons on the AC control and release simultaneously. The number of faults will be displayed on the left, and the fault code(s) on the right. Purchase items here. Further detail follows the purchase area. Use paypal for credit cards, and Dwolla for payment by check. NOTE: USA shipping addresses only! OUR NEW KIT REQUIRES NO MODIFICATIONS AT ALL AND INCLUDES THE STOP ARM! 9-5 DRIVER SIDE VENT NOT HOT OR COLD ENOUGH? 9-5 Passenger side VENT NOT HOT OR COLD ENOUGH? 9-5 Rear seat VENT always HOT OR COLD ? PLEASE DON'T PULL THE ENTIRE DASH APART! We now have a more economical and time saving solution to the heater-A/C issue addressed by SAAB SI871-2322. It has been superceded by SI 854-2396 (22 pages, mostly directions for removing the dash and heater box) There are also SI 854-2450 and SI 854-2411, both of which address another issue. 9-5 Air Conditioning not cold? 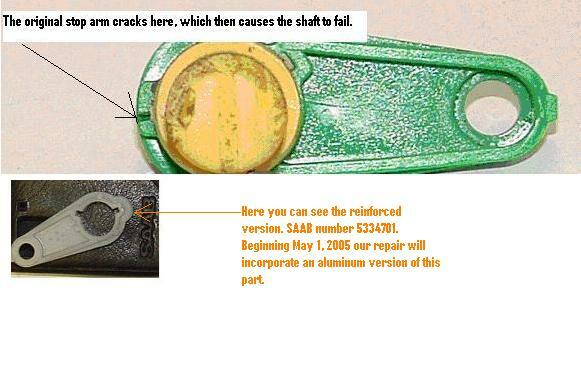 SAAB PART NUMBER 5335831 or 5336664 REPAIR KIT and DETAILED INSTRUCTIONS. With our NEW kit and detailed instructions you can repair this miserable failure WITHOUT REMOVING the heating and ventilation unit from the car, IN LESS THAN 1 HOUR! Save 10+ hours labor. 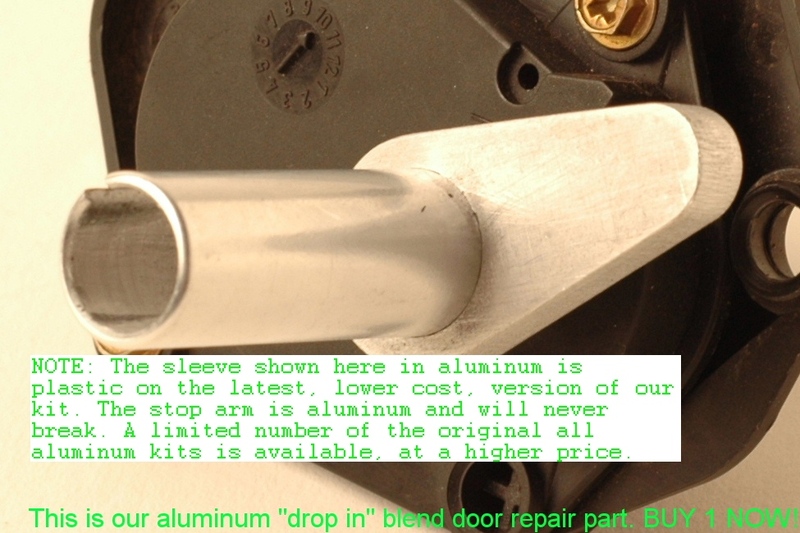 Repair parts are to tolerances of 0.025mm and pre-indexed to within 0.5º thereby eliminating stress to the blend door. Additionally no modification to the heater box is required and no glue or adhesive is used. The instructions included call out all other known trouble areas for a no comeback job. A DIY GAVE US THE FOLLOWING FEEDBACK! "Hi John, ...it arrived a week or so ago Just back on the 'box' after spending two hours fixing the system. Directions were clear, part fit well and I am very pleased to report that the self-test now shows a '0' after the test... . Keep up the good work! You have my strongest endorsement for your product as it has saved me $2000 in repairs and a lot of down time on the car. Sincerely, Brooks"
REPAIRING A CODE 8, OR CODE 11, FIRST, USUALLY SOLVES CODE 13 PROBLEMS. CODE 21? OR RECIRCULATION FAILURE WITHOUT A CODE? 9-5 click for Recirculation motor repair. 9-5 ACC code page has additional diagnostic info. Note Error code B2409 (code 21) is not related. It is usually caused by failure of SAAB part number 4869426. As this part controls the recirculate door, poor cooling performance could occur similar to the blend door issue. Failure of 4869426 can occur without a code being present. The code presents after the motor fails due to constant running. Always check the function of the recirculate door when cooling performance is poor, even if the blend door shaft was found to be broken. Also it is not uncommon to have noticable differences in temperature between the left and right side when the freon level is low. 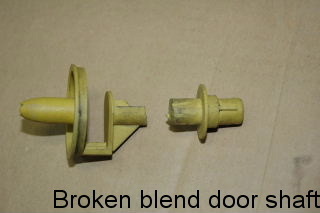 Please verify that the blend door shaft is indeed broken. Looking for the A/C low side fitting on a 9-5? 9-5 low Side fitting location! Not possible to regulate temperature on either left or right-hand side in front? Code 08 shown on ACC display? It is not possible to regulate the temperature on either the left or the right-hand side in the front. Error code B2295 may be present if the right-hand shaft is broken, and B2495 if the left-hand shaft is broken. Difficult to regulate the temperature. Parts required, IF YOU DO NOT BUY OUR REPAIR KIT! 53 35 831 (CA: 30591598) service kit, heating and ventilation unit, LHD. 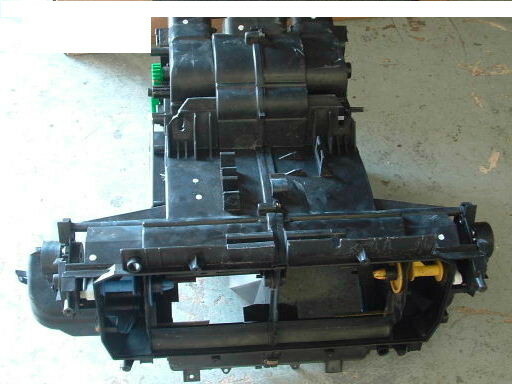 Note: latest part number is 5336664 now priced near $700.00 New heater box from Jim Ellis SAAB. 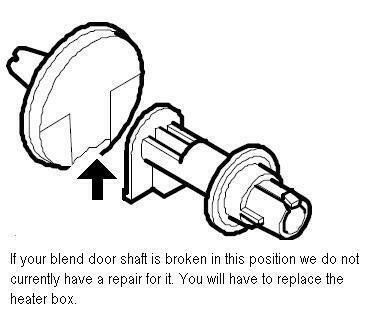 This service information applies if one of the damper shafts is broken. Make sure the wiring harness cannot come into contact with moving parts by the motors.